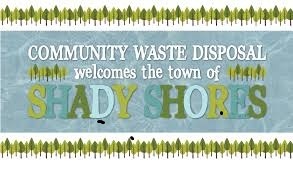 The Town of Shady Shores has entered a contract with Community Waste Disposal (CWD) for the collection of Solid Waste and Recycling Services. Here are a few important reminders. CWD has provided a brochure to assist you with questions you may have during this time. TRASH PICK UP DAY- Wednesday is the day; the service runs from 7 am to 7 pm so be sure to have your carts at the curb by 7 am. 1. All limbs should be placed with trunks parallel to the street, not blocking the sidewalk. An exception is cardboard will be accepted outside the cart if it is tied and bundled. In addition to weekly trash and recycling your quarterly bill includes Household Hazardous Waste/E-Waste on Demand collection to dispose of your hazardous waste. Accounts are billed on a quarterly basis one month in advance. The regular rate for service is $58.78. There is a discounted rate for seniors (65 and over) of $54.70. Payments may be made by check, cash or money order. We also offer electronic payments. Credit or debit cards will be accepted however a convenience charge will apply.